Who else is using a Fishman Triple Play here? FTP is a wonderful device and I am thankful for its creation. But it does have it’s own challenges. It doesn’t help that much of it’s implementation is undocumented officially. Thankfully the folks at V-Guitar forums have been a great resource. How many other guitarists are trying to use FTP with GigPerformer? I find that I sometimes have unique issues that keyboard players just don’t have and don’t understand why I even have to ask. So I would love to know if there are others here that I can bounce stuff of of. 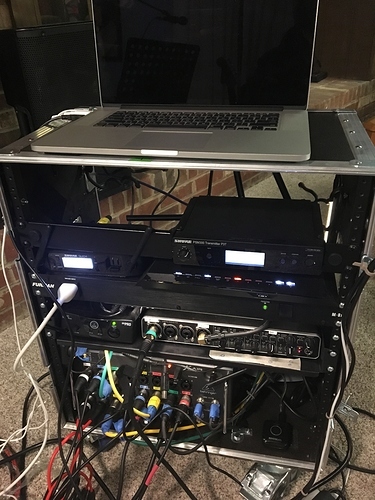 With gigperformer’s new setlist function, I have now eliminated the use of Tripleplay software during shows and operate in the hardware mode. @thunderfingers. Thanks for responding. I saw your video before and I think you’ve done a nice job with your setup. So your 100% wireless, right? How do you like the Guitar Wing? I have seriously considered getting one in the past. Is it your only controller? Do you use the slider strips for expression control? Have you ever had any issues with interference or intermittency? Playing an FTP equipped Stratocaster with (I assume) a floating bridge, what’s your strategy if you break a string? Do you move the FTP and Guitar wing to a back up guitar? Have a second guitar outfitted with another set of FTP & Guitar Wings? Or do you have the bridge locked down so that your other strings don’t slip out of tune? See my answers within your quoted text. Thanks for responding. I saw your video before and I think you’ve done a nice job with your setup. So your 100% wireless, right? All wireless with guitar wireless, guitar wing wireless, Tripleplay wireless and in-ear monitor wireless. Also no pedals! How do you like the Guitar Wing? Yes. It works reliable but the sensitivity of the slider surface is a bit inconsistent. I have seriously considered getting one in the past. Is it your only controller? Do you use the slider strips for expression control? No. The sliders are also a touch switch that I try to use for tap tempo, but I I’m not comfortable that it is reading reliably. Have you ever had any issues with interference or intermittency? None. Since I determined the heaviest pick I can use To avoid breaking strings- it only happens once in 30 shows. If that happens I have straplocks that allow me to switch guitars rapidly. The other guitar has an external Tripleplay that was partially embedded and a second guitar wing. My guitar wireless and in-ear are on the guitar strap. All that stuff is heavy and caused back issue day after gig. I shortened my strap, got a padded strap, changed to lighter titanium bridge and had the tech do the “swimming pool” cut out under the pick guard. All that helped. The video I put out shows what is now my backup system. My new system is essentially the same hardware except I upgraded my in ear to Shure PSM 300- which the additional clarity has made a huge difference in my performance. I also have a Behringer XR18 mixer and a light controller in the rack. Essentially it’s the band’s pa with my stuff already connected. This is my current rig. There is a 5ghz wireless router for the xr18. I use 2 MacBook pros. One with the behringer um404 for guitar (mainstage/guitar rig) and guitar synth (gigperformer) then the other uses gigperforner with the xr 18 to process vocals and record 18 tracks. BTW - I said no dropouts on my wireless- that pertains only to guitar wing. Tripleplay gave me lots of problem until I discovered turning off Bluetooth and Wi-Fi on my phones and computers has almost completely solved it. Did you ever have an issue with your FTP dongle transmitting duplicate data on both the FTP-Guitar and FTP-Control inputs? I just realized this was happening (I’m a recent convert from the Roland 13-pin camp). In the shot of your GP rack space in the video, it looks like you are using the FTP-Guitar device for your MIDI input block. Is that true? Any disadvantages to using one over the other? I definitely see the need for 2 Macs. Eventually I’ll move to s virtual guitar rig, but right now I’m only using my MBPro for FTP/GP synthesis and running tracks occasionally. I am using a Helix for my guitar rig and audio interface. The MBP just can’t handle trying to do both simultaneously. Besides, if the Mac ever crashes, I still have guitar sounds to get through the song. (GP has crashed in performance twice in recent weeks, despite having fully tested my gig file the previous days - tho these are the first times that has happened). I must say I am thrilled to be able to share this stuff. Thanks for your interest. So that must mean that you use the bluetooth dongle(s) for the guitar wing(s) instead of the Mac’s built in wireless? Yes. I have the guitar wing software that sets the midi codes in my startup file and click the connect button which seeks the guitar wing. It is my belief that the Mac built in Bluetooth and Wi-Fi cause problems w ftp wireless connections. I also believe that my phone in my pocket inches away from those devices causes problems. I turn off my phone Wi-Fi and Bluetooth. Did you ever have an issue with your FTP dongle transmitting duplicate data on both the FTP-Guitar and FTP-Control inputs? That’s what it does. You are supposed to use the guitar port. I do not use the Omni input on gigperformer and that is one reason. I just realized this was happening (I’m a recent convert from the Roland 13-pin camp). I still have my gr33 and a strat w 13 pin. In the shot of your GP rack space in the video, it looks like you are using the FTP-Guitar device for your MIDI input block. Is that true? Any disadvantages to using one over the other? Fishman recommends you use the midi guitar port rather than the midi control port. Btw- I use the guitar wing for control rather than as an instrument you play which is what they had in mind. I’ve developed a gpscript to sync the guitar wing to the rackspace widgets in gigperformer. I also use midipipe to connect midi between gigperformer, mainstage, guitar wing and lighting controller. I have plans to update and there is a bug, but I’m glad to share if you are interested. I have recently improved the reliability of my system and I think some is due to the elmination of the tripleplay software and using tripleplay in the hardware mode. @thunderfingers How kind of you to offer! I’d be honored. Thanks for all your help and informative answers! Since I have never used the GW before, may I ask what you mean by “sync the guitar wing to the rackspace widgets in gigperformer”? For example, I have a boost button on my gigperformer rackspace that essentially is a bypass for a gigperformer gain block set to -4.5db. On the rackspace front panel the bypass is linked to a red light. When I click the red light with the mouse, and it turns on, the gain reduction is bypassed. Click again the light goes off and the -4.5 db gain block is in effect. That’s how it works with just gigperformer. Now I want the same function w guitar wing so I program a button on guitar wing to be red when on and dark when off. I decide what cc code makes sense then have the gigperformer red light widget learn that code. No script needed for that part. But some rackspaces and some variations need to turn in boost when you switch to it. On Shut Up And Dance, I play a synth sound at normal volume until the solo comes up which is a different rackspace because it glides from note to note. When I change to that patch, I need gigperformer to send a signal to guitar wing that boost is on and to set the light to red. So I wrote a gpscript that fires on rackspace activation, change of variation and change of widget to keep the guitar wing light and logic synced with my patch change. Also a button on ge to control a fader from guitar to synth, both, alternate patches. I have a dial in my rackspaces for 10 guitar patch presets and 10 dmx light scenes. These are all read and transmitted when I change rackspaces or variations. One bug I have is if I start in the blend mode, then turn it off, it should go to guitar only or synth only depending on what it was before I Went to both. It’s not always doing what I want. I need to test it to see exactly where I am at and the fix it. Btw- I used guitar wing to trigger the gigperformer audio player. I just used one of the slider strips which has a key switch as well as the variable fader. We did Thriller for our Halloween show and it triggered my edit of Vincent Prices monologue. I found his monologue as an isolated track, so it was pretty fun! Did you get the Guitar Wing? How is it going?